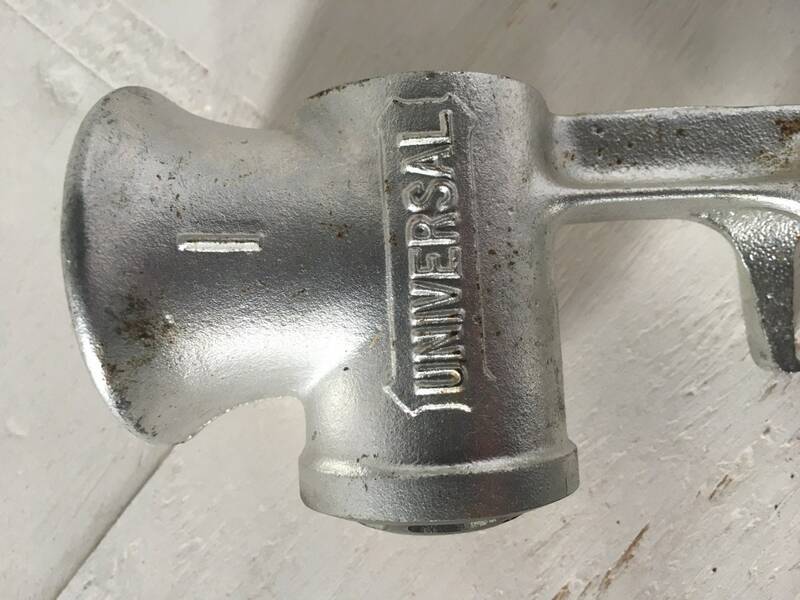 This antique Universal No. 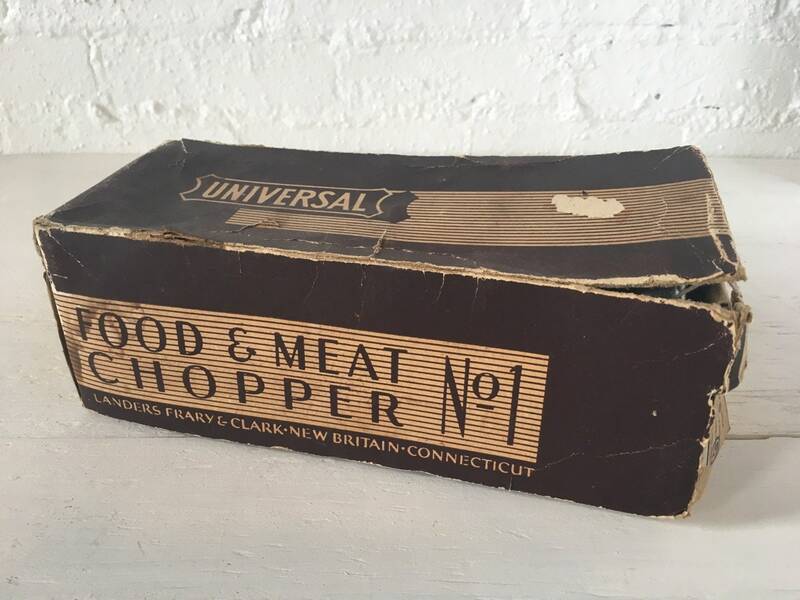 1 Food & Meat Chopper is in great condition and looks barely used. It comes with three self-sharpening cutter - coarse, medium, and fine, and has a long handle to make cranking easier. I believe this was a commercial model meant for serious work. 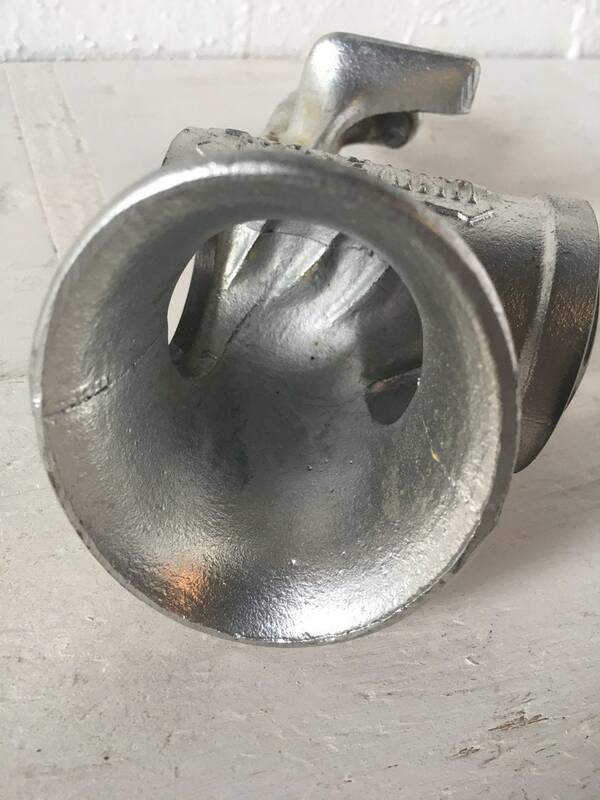 As the photos show, the pieces are in bright and shiny condition, yet there is slight surface rust in some spots and I believe this will clean up no problem. The original manual is included, as is the box. The box is falling apart as you can see. 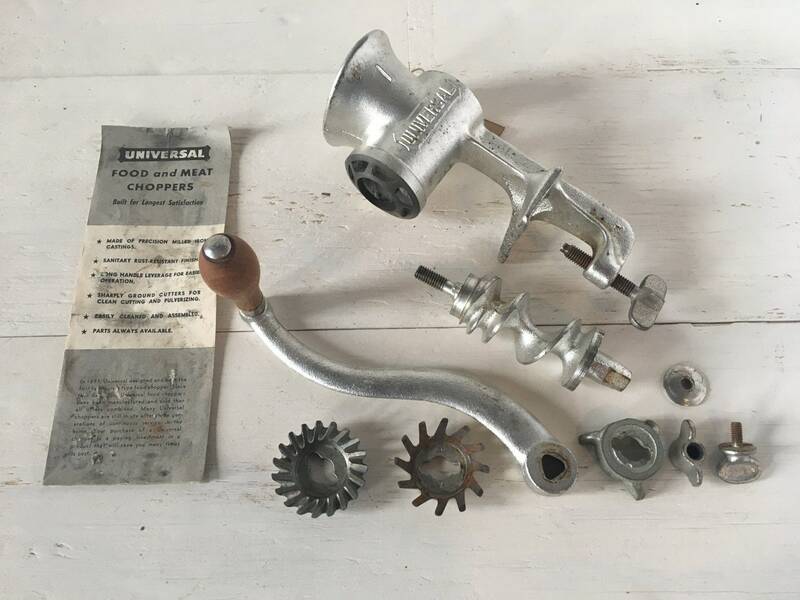 These vintage hand cranked food & meat choppers are ideal for anyone who loves to use traditional hand powered equipment for their food processing, and perfect for the off grid homesteader. Also great for the artisanal chef or butcher looking to be as authentic and traditional as possible. We accept payment by credit card through Etsy Checkout as well as PayPal. Interested in purchasing on lay-a-way? Contact us. We generally ship orders Tuesday and Thursday mornings. We USPS Ground to keep your costs down, but you do have the option to choose Priority Mail as a faster shipping service. Your items will be professionally packaged to insure safe delivery to you. We now offer International shipping for many of our items. Large or heavy items listed as LOCAL PICK UP will need to be picked up in Racine, WI. If you will be picking up an item you need to let us know *before* ordering so we can remove any shipping charges that show up on the piece. Racine is conveniently located between Milwaukee and Chicago. We are no longer offering freight shipping since we have been unable to find a cost effective service that is both easy for our customers, and for us. All sales are final, but if you are not happy with your purchase please contact us to discuss it. Refunds due to loss or damage during shipping can be arranged as long as we are notified in a timely manner and you can provide documentation. Sorry, but we can not refund shipping costs or pay for return shipping. Relic Antique & Vintage offers no warranties on antiques. We do our best to accurately describe and photograph each piece and try to point out the condition and any flaws we can see. Our antiques and vintage items should be considered used unless otherwise stated. Please review all of the photos and read the full description on any items you are interested in, and if you have any questions feel free to contact us! If you see an item that you can't live without, but aren't ready to purchase yet, we can hold the item for you. We will hold it for no longer than 24 hours free of charge. If you need us to hold it for longer then 48 hours we now require you to pay a deposit. Any deposits paid will be applied to the final purchase price. Deposits are not refundable if you do not purchase the order you asked us to hold for you. Some larger items may be listed as LOCAL PICK UP and will need to be picked up at our location in Racine, WI (Between Milwaukee & Chicago). Etsy may show LOCAL PICK UP items as having "Free Shipping" when in fact they DO NOT have free shipping. We clearly mark LOCAL PICK UP in the product name, and in the full description. If you have any questions about an item, please contact us before placing your order. If you order a LOCAL PICK UP item and you are not local to us we will contact you to verify that you will be picking up the item. If we don't hear back from you with in 24 hours of contacting you will will cancel your order. At Relic Antique & Vintage we never share or sell any of your information. When you order from us via our Etsy shop you may provide info such as your full name, shipping address, email, or phone and that information is only used to fulfill your order or communicate with your about your order. All credit card or other payment methods are securely handled by Etsy and we never see or store that information.